When I think girl boss, I definitely think strong female who is showing up to take her place wherever she goes. When it comes to style, I think of a power suit. That’s why today I want to share chic suits for women to make you feel like a girl boss. Because every women should feel like one. Whether you’re climbing up the corporate ladder, working retail or making a name for yourself, you’re creating a life for yourself. You should feel proud. You should feel like a boss. The one suit you can never go wrong with is a classic black suit. And for some reason that has made it even more difficult to find one? Maybe it’s the pressure of it being a classic duo that I would wear forever. However, it’s the suit for women you can’t go wrong with. Black is also such a comfortable color that will easily make you feel like the girl boss you are. The first option I have for you is a budget one from Zara. It consists of a black suit blazer with four big buttons on the front. You can pair it with these wide trousers from Zara. Second option is a little shiner. Get your classic power suit from & Other Stories. You can find the slim fit satin trousers here* and the straight fit satin blazer here*. Last option is also a budget option that I matched together. They’re classic cigarette Mango straight fit trousers* that you can combine with this Mango structured crepe blazer*. Super chic and a classic pair you can wear for years. If you want something more color, choose one solid color and find yourself the suit for you. I have a dark green suit from Zara because dark green is the new color for my business Fiona Gobbo Creative. A solid color can be very simple and chic — a dark green, maroon red or camel — or you can go bold and fierce with bright colors. Top pick is obviously my own dark green suit from Zara. You can find the wide trousers here and the matching blazer here. Zara also has a camel suit with a long belted blazer and wide, flared trousers. If you want to go bold, check out the lilac suit from ASOS design. The cut and fit is really simple but the color is fresh and chic. Click the ASOS design tailored lilac occasion blazer* home with the matching trousers*. This post with suits for women can’t be missing the OG of suits: the pink suit. Reclaiming the color and making it a powerful statement. I have a suit from Zara that’s hot pink that I got years ago. It was actually the first suit I’ve owned. For some reason I never really worn it because it was such a bold color. Now I feel like it’s the perfect color to chose for a power girl boss suit. Zara doesn’t have a hot pink option in stock right now but they do have a pastel, spring pink in their collection. The cut is simple and classic with cigarette trousers and a structured blazer*. Lucky for you, Topshop does have a hot pink In their collection. The duo is a pair of tapered Suit Trousers* with a fully lined jacket with black buttons*. If you’re more of the muted pink hues, I got you. This suit is more of a light peachy pink color. The AllSaints Aleida suit is more laidback and unstructured but it still looks chic. The trousers look like they feel like you’re wearing sweatpants — which is always good! 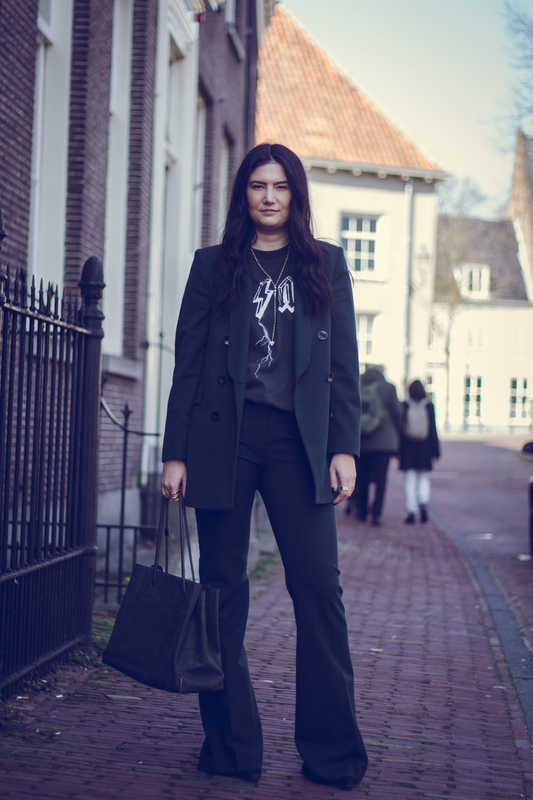 You can find the blazer here* and the Aleida trousers here*. Another bold suit is the printed suit. It can be a fierce, bold statement but there are also options that are not super out there. One things I will say is that if you don’t have the attitude to pull off the bold print, go for a solid colored power suit first and build your confidence to a print. I have one printed suit from H&M with dark purple and blue stripes that I love. It’s a print but on the muted side. The first option I want to show is the Ganni suit. It has a classic check print but in a muted yellow tone with black stripes. Still a statement but not too out there. What I also love is that it has a longline boyfriend blazer*. 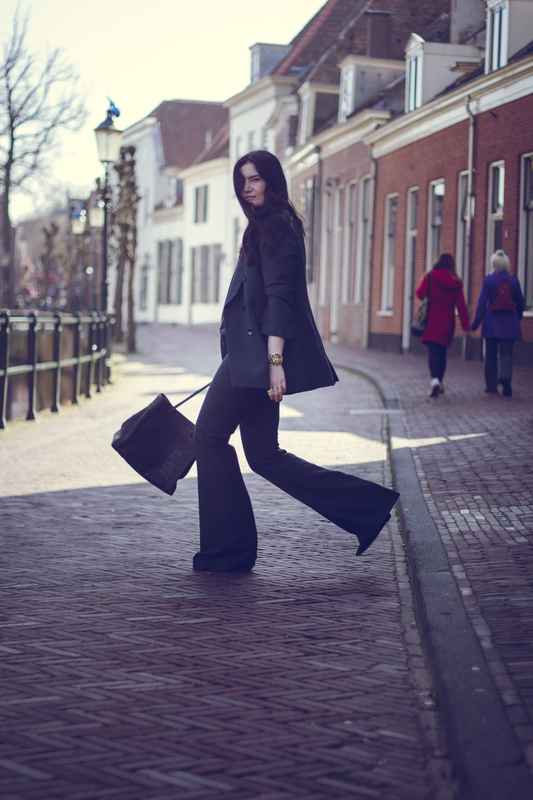 The suit trousers* are high rise and cropped straight legged. And now on to the bolder print. First up is the ASOS Design mono geo slim suit with a graphic black and white print. It’s a true statement that will have heads turn when you walk into a room. You can find the trousers here* and the matching blazer here*. If you love an animal print as much as I do, then you’re going to love this more luxe suit from Anine Bing with snake print. The suit is a structured blazer* with flared trousers* with slits on the sides. The short suit is the perfect suits for women option for spring and summer. I love this combination of shorts with a blazer. I know to some it feels wear to match the two but try one out and see what you think. I love wearing a long sleeves with shorts. Personally I have one in pink — check it out through the related link below — that’s weather appropriate but also work chic. The first option I came across that I instantly love was this Chriselle Lim ruched double-breasted striped blazer* with paperbag-waist striped shorts* in peach. Or go for a more classic with this ASOS Design dad suit blazer* in grey pinstripe with matching suit shorts*. Another one that I loved are these H&M dark green linen shorts* with shorts*. Linen is also perfect for the spring and summer time when you want to feel fresh but chic. Which of the girl boss suits do you want to add to your wardrobe?